My daughter has been dying to ride on the back of my motorbike for ages now. The legal requirement being only their feet can reach the foot pegs and the wearing of a helmet. Since my daughter is rather tall, there’s been no problem there, however from a maturity point of view we have held off for some time. With her 8th birthday later this year, we have decided she is now old enough to ride on the back of the bike and hark back to the days when she was a nipper and would ride on the back of my bicycle. Of course, safety is a paramount concern, so we have been keen to kit her out in some decent gear to protect her. 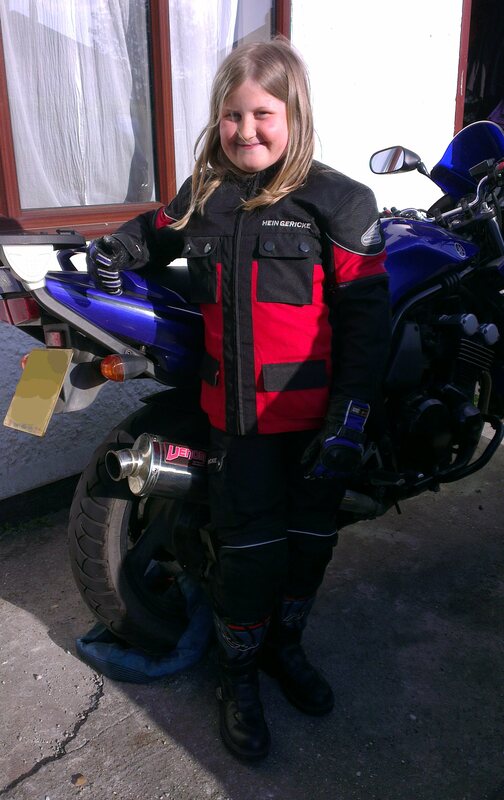 A tricky prospect considering the price of motorcycle gear and the rate she will grow out of it, and so we hit ebay with a vengeance to find decent gear without breaking the bank. We managed to find a brand new set of Hein Gericke textile jacket and trousers (with tags), for £40, originally priced at £160 new! Full of armour, removable lining and with extendible arms/legs, so should hopefully last a little while. Next up were some second hand RST boots for £13 (new price £50) and finally some basic second hand unbranded leather gloves for £6. Not bad going at all. Just need to source a helmet now, but that’ll entail a trip to shop for fitting and buying brand new. Be wary of cheap unbranded gear with little protection, often only good for leisure wear. A lot of kids gear is motocross orientated which albeit has good impact protection, has less abrasion protection (for tarmac) or weather protection. Sizing can be very random, always query real measurements from sellers.